The bailout of the Greek government in 2010 started Europe down the path of bailing out insolvent European institutions. The focus has been on government finances but may shift quickly to bank finances. Ireland was the first country to need help with saving its banks. Others may soon follow. Europeans are nervous that an insolvent government may do something desperate like implement capital controls where "Limited cash withdrawals from ATMs and limited movement of capital have been considered...", freeze bank accounts limiting the amount people can withdrawal from their accounts, or simply take peoples’ pensions or retirement savings. Money in a bank account is easily located by a desperate government so Europeans are taking possession of some of their money. 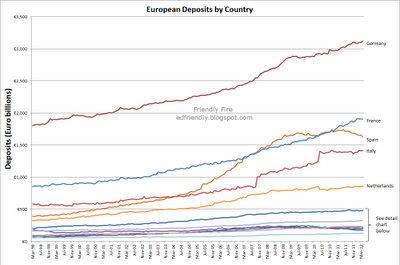 The two charts below show the amount of deposits in Eurozone countries. 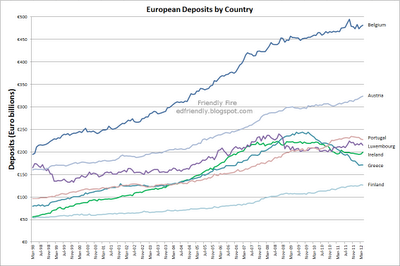 Portugal, Ireland, Greece, and Spain have all seen decreases in bank deposit amounts. 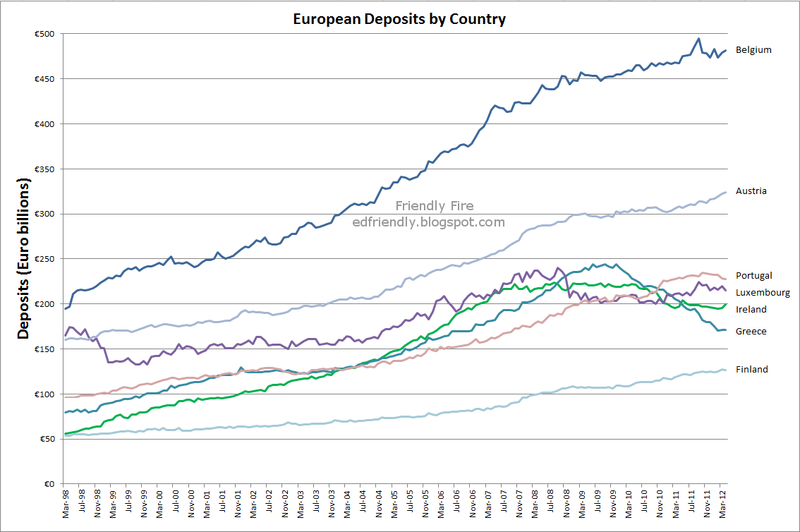 Italy has not seen a decrease in deposits but the amount of deposits has leveled off and is not increasing in Italy. 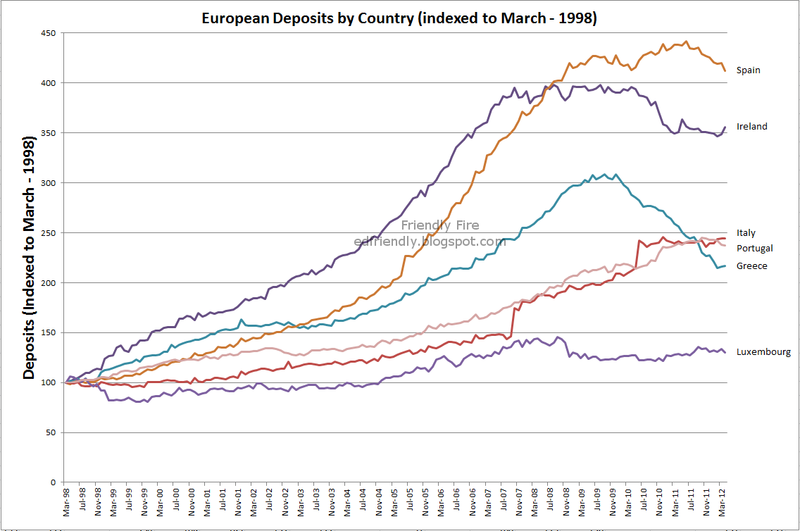 Another look at the data was taken where the deposit level was indexed so that the amount of deposits as of March, 1998 equaled 100. This way a comparison between the countries can be made regardless of overall deposit size. 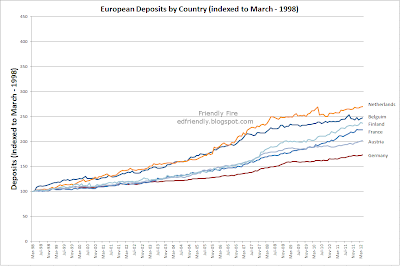 The two charts below show the change in deposits since March, 1998 for the different Eurozone countries with deposit levels indexed to 100 for deposit levels on March, 1998 (Cyprus, Estonia, Malta, Slovakia, and Slovenia were excluded since their deposit levels were less than 100 billion euros in 2012). 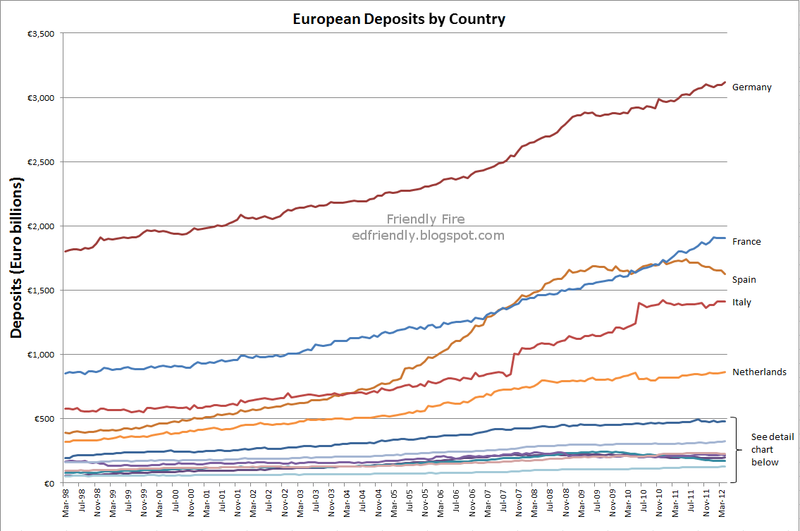 The first chart shows countries where the deposit level is increasing at a steady pace. 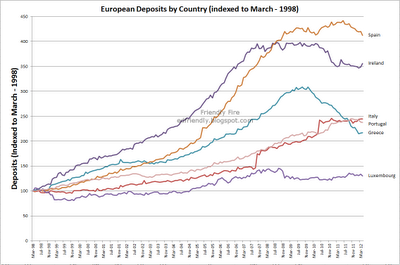 The second chart shows countries where deposit levels are flat or decreasing. 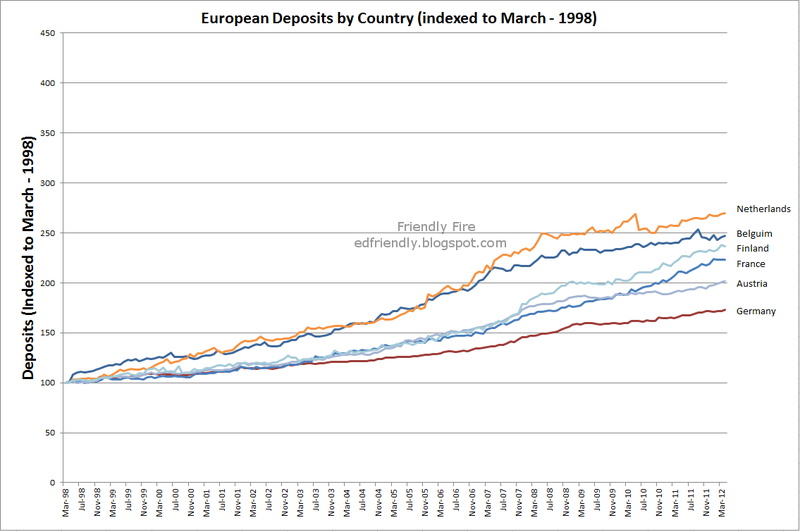 It also shows that Spain and Ireland had the largest increase in deposits since 1998. Not surprisingly, these two countries had more of a real estate boom and bust since the money supply was expanding at greater rates in those countries. Why would decreasing deposit levels be troublesome for banks? All modern banks practice fractional reserve banking. A customer deposits $1,000 in their bank account. The bank proceeds to loan out $800 of the deposited money. The loan customer makes a purchase with the $800. The recipient of the loaned money deposits the $800 into his bank. That bank loans out $640 of the deposited money. This money multiplying scheme continues across the entire banking system. Fractional reserve banking can exist as long as depositors do not withdrawal their money. Banks gamble that customers will not withdrawal their money from the banking system all at the same time. When the original depositor arrives at the bank to withdrawal his $1,000 the bank will have to scramble to meet the customer’s demand for cash since the bank loaned out $800 of the deposits. The bank will attempt to call in loans from customers, stop making loans, sell assets (government bonds are held by many banks, which banks could be selling to raise cash. If so, this could explain the rising yields on Spanish bonds as Spanish banks sell bonds to try and raise cash for deposit withdrawals - just a hypothesis), or borrow from other banks to meet demands for cash. If the bank calls in loans from customers, the called customer will reduce the amount of his deposits at his bank to pay the bank calling on him to repay the loan. Now that bank will have to scramble for cash. The fractional reserve banking process multiplies money when money is deposited but the process quickly contracts the money supply when money is withdrawn from banks. Panic and contagion spread across the banking system since the banks are unable to meet the demands of depositors because they have very little of the depositors’ money on hand. Thus, a bank run is born. People will begin to lose faith in the banks which results in more people withdrawing their money from the banks. The bank run will then begin to accelerate. What to do? Follow the age-old investment adage: he who panics first, panics best. More bailouts ahead….this time for the banks.